Running water seems always to have held a certain allure for mankind. Since the beginning of time, rivers and creeks have been used for transportation, trade, recreation, and . . . well . . . water. They have a way of being simultaneously new and ancient. Timeless and spiritual, they have been the subject of writers from Moses and David to Longfellow and Kipling. “There's somethin' 'bout a river rollin' by," Gary P. Nunn musically quipped, “that makes you want to jump off in it, and let it take you for a ride." But what if you do? Can you ride that river through another's property? Can someone else ride it through (or along) yours? What does the law have to say about the rights of landowners and the public in rivers and streams? If they are navigable waters, quite a bit. Oddly, running water is optional. Because the respective property rights in rivers and streams depend on whether the water is navigable, it's appropriate first to examine the standards for navigability. 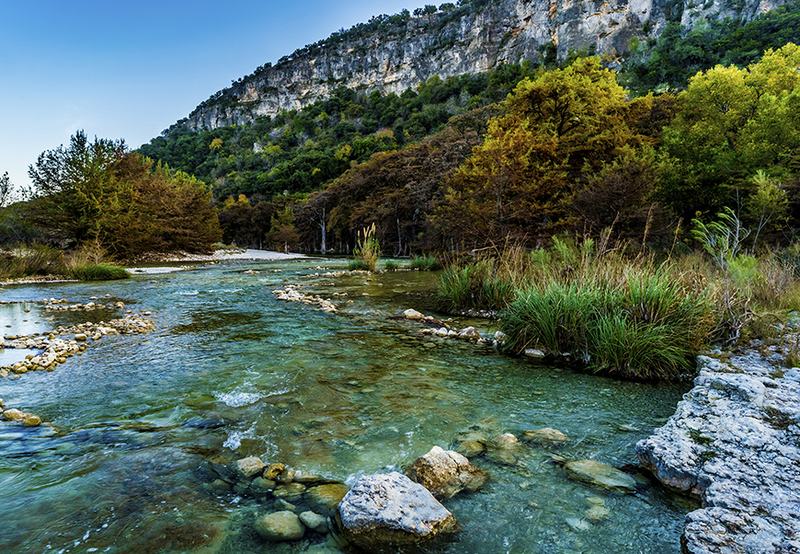 Texas law traces its history to the king of Spain and a body of Spanish law called Las Siete Partidas, which states that the things that belong to all of the creatures that live in the world are air, waters of the rain and sea, and its banks. Any living creature may use them according to its needs. It goes on to say that ports, rivers, and public roads belong to all people. Spanish law became Mexican law, and when Texas became an independent state in 1836, it took all of the rights of the previous sovereign. When Texas joined the union, it retained all of its preexisting property rights, so in determining public and private property rights, federal law has little application. This is also why Texas state waters extend nine nautical miles off the coast, instead of the usual three. A stream may be navigable in one of two ways: navigable by statute or navigable-in-fact. It does not have to meet both criteria; one is enough. A stream is navigable by statute if it retains an average width of 30 feet from the mouth up. This seems straightforward enough, but how this is calculated and determined by the courts leaves something to be desired. In general terms, the average distance is measured between the “fast" land banks, which separate the stream bed from the adjacent upland and confine the waters to a definite channel. It is not measured at the actual or average water level, nor is it measured from the “gradient boundary," which divides public and private ownership. There is no “bright-line rule" for whether a stream is navigable-in-fact. Generally, it is navigable-in-fact if it is capable of being used in commerce. Courts have examined whether it can be used for “customary modes of trade and travel," including whether it is passable by boat or raft and whether it can be used to float logs. It does not have to be usable all year, but as the court has said, “Behind all definitions of navigable waters lies the idea of public utility." The Texas Constitution (Art. XVI, Sec. 59) and the Water Code (Sec. 1.003) set out broad public policy for state conservation and development of the state's natural resources, including the navigation of Texas waters. All public Texas freshwater lakes, rivers, creeks, and bayous are open to the public (Tex. Parks & Wild. Code Section 1.012). This has been further developed elsewhere in Texas statutes and cases. 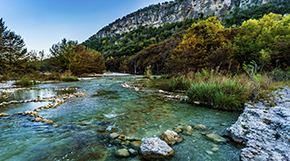 The Texas Supreme Court has held that navigable streams (whether navigable by statute or navigable-in-fact) are public highways and that lands underlying them are held in trust by the state for the use and benefit of all the people. Navigable waters are held by the state for the benefit of the public, which has the right to travel up and down the bed of a navigable stream even if the stream goes through private property. The public may use the waterway for boating, fishing, swimming, wading, and walking, probably including walking in the dry bed of a navigable stream. These are the specifically recognized rights of the public, and there may be more. Obstruction of a navigable waterway is a criminal offense (Tex. Pen. Code Section 42.03), as is restricting public recreational access (Tex. Parks & Wild. Code Section 90.008). Even a person expressly granted authority to build a bridge or dam may not obstruct the navigability of the stream. If a person legally dams a stream to create a lake, the stream bed is owned by the state; the rest of the lake bed is owned by the landowner. The public has the right to navigate the waters and take fish (both of which belong to the state) but not to use the bed and banks of the lake. For example, see Diversion Lake Club v. Heath, 86 S.W.2d 441 (Tex. 1935). The public may not cross private property to reach a navigable waterway but probably may make limited use of the banks. The courts have left open the question of whether the banks may be used for portage and scouting of hazards, but it is likely that these rights are encompassed in the right of navigation. The public may make use of the banks and adjoining property in an emergency or if otherwise necessary to avoid imminent harm (Tex. Pen. Code Section 9.22) but is liable to the property owner for any damages. Those members of the public who use the banks in emergencies or in portage and scouting should use the banks only as necessary and with due respect for the property and the rights of landowners. In any of these cases, no amount of use is sufficient to create a prescriptive easement (Tex. Parks & Wild. Code Section 90.007). There is an exception to state ownership of navigable waterways, but it does not dramatically change the rights of the public. Some old surveys were drawn so that private tracts of land included navigable waterways. Since the navigable waterways were owned by the state, this was improper. To rectify the situation, the legislature passed the “Small Bill," which relinquished title of the stream beds to the landowners but reserved the rights to the sand and gravel to the state and the rights of use to the public. Therefore, as a practical matter, the public has the same rights in these streams as others. The landowners were happy to retain title to the oil and gas underneath. Where do the rights of the public end and those of the landowner start? As mentioned previously, the general rule is that the dividing line is the “gradient boundary," which is “midway between the lower level of the flowing water that reaches the cut bank and the higher level of [the flowing water] that just does not overtop the cut bank." (Diversion Lake Club v. Heath, 86 S.W.2d 441 [Tex. 1935] and Oklahoma v. Texas, 260 U.S. 606 ). In most cases, that line is not easy to define. Additionally, if a property description says otherwise, the boundaries may be different. Landowners are also restricted in certain ways from using the banks and beds of navigable waterways that flow along or through their property. In addition to the restrictions on obstruction of navigability, landowners (and the public) are generally prohibited from operating a motor vehicle in the bed of a navigable waterway (Tex. Parks & Wild. Code Section 90.002). Numerous exemptions from this rule are found in Texas Parks & Wildlife Code Section 90.003. For example, a state, county, or municipal road right-of-way is exempt. The bed may be used in usual and customary agricultural activities or in an emergency. Exemptions also apply for government business, uses authorized by mineral leases, and for private crossings established on or before December 31, 2003. Additional exemptions also exist and are enumerated in the statute. While landowners must allow members of the public to exercise their rights, the rules regarding trespass are typically the same as with any other property. Those on the property of another are trespassing if they enter with notice that entry is forbidden or if they remain on the property after receiving notice to leave. What qualifies as notice is set forth in the Penal Code (Section 30.05). Notice may be given by oral or written communication by a landowner or his authorized agent. Property posted with signs or with purple paint as required by the statute satisfies the notice requirement. Additionally, a fence obviously designed to exclude intruders or to contain livestock constitutes notice, as does the visible presence of a crop under cultivation or being harvested. Landowners are understandably protective of their private property and the navigable streams that pass through or along it, but if paddlers, floaters, or fishermen should pass by, the landowner might want to speak softly. Those people may have every right to be there.